The Canadian startup will build its first reactor facility in Portland to turn nutrients from wastewater into fertilizers. 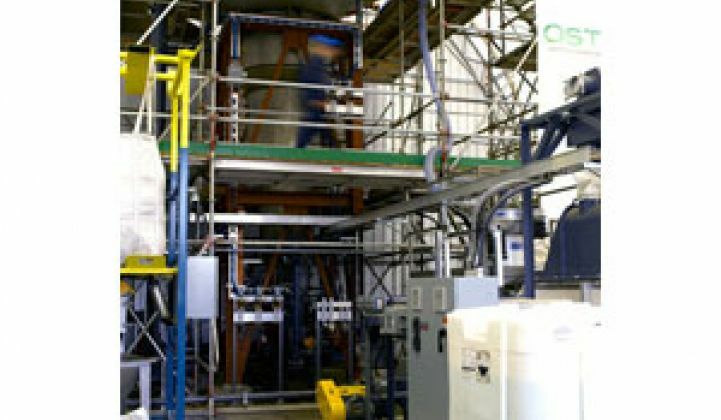 Ostara Nutrient Recovery Technologies Inc. said it has raised $10.5 million in venture capital to build commercial plants that make fertilizers out of wastewater. The Canadian startup, founded in 2005, has developed a process for treating and harvesting nutrients such as phosphorus and ammonia from city wastewater treatment plants. Ostara's reactors can crystallize the nutrients, which would be taken out of the chemical reactors to be dried and bagged, said Phillip Abrary, CEO of Ostara, in an interview today. "The fertilizer offers a unique value. It's environmentally friendly because the phosphorus doesn't leach out to the environment but takes many months to dissolve," said Abrary. The company, located in Vancouver, British Columbia, has carried out several pilot projects and built its first commercial-scale reactor that came online last July in Edmonton's Gold Bar wastewater treatment plant in Canada's Alberta province. Ostara will build three reactors at the Durham Advanced Wastewater Treatment Facility in the Portland, Ore. metropolitan area. The equipment, which is expected to start operating in the spring of 2009, will be capable of treating wastewater from about 500,000 people, Abrary said. The company signed the $2.5 million project with Clean Water Services, a public utility, to build the reactors for the plant near Portland (in the town of Tigard). Ostara also has carried out a pilot project at a corn ethanol plant in Minnesota. A pilot project can process 5,000 liters of wastewater a day, whereas a commercial plant can do 500,000 liters per day. Additionally, the company is marketing its technology to operators of food and industrial processing plants. For the Portland project, Ostara will be engineering and building the reactors and leave their operations to wastewater plant employees. Abrary said the company would be interested in not only developing but also operating reactor facilities, and charging the customers service fees. The company is talking with fertilizer distributors in North America for its product, which will be sold under the brand Crystal Green. Ostara expects its fertilizer to be available on the market next spring, after the reactors for the Portland project go online. A commercial reactor could produce about 1,000 pounds of fertilizers per day, according to the company Website. Ostara's customers get a share of the fertilizer revenues, Abrary said. Meanwhile, the company is negotiating to build two other reactor facilities in the United States, he said. Ostara's technology came from research at the University of British Columbia. VantagePoint Venture Partners, in San Bruno, Calif., led the Series A funding, which also came from Foursome Investments Limited in London. Before raising the first round, Ostara had received $7.5 million from company founders and angel investors, Abrary said.